As some of you are aware (or not), I did a public poll of the most wanted features for GNOME Calendar. It was a success, and 216+ votes were collected by the time I’m writting this post. The earlier versions of Calendar indeed had a very raw calendar management dialog. It was dropped a long time ago – in fact, more than 2 years ago – in favor of a new, redesigned dialog that actually never came. Some experimental work happened before 3.16, but it wasn’t complete nor stable enought to be merged. Since we’re talking about the topmost wanted feature to land on Calendar, we wouldn’t dare to make it like any other normal feature. No. Period. This is what most people want from Calendar, and it’ll be done with all the care, attention to details and love that the Calendar Development Team can give to it. We’re nonstop bothering keeping close contact with the Design Team to deliver high quality mockups, and many experiments are going on. We’ll be able to make it for 3.18 release. Thanks to Allan Day, Lapo Calamandrei for their commitment. They are true heroes! Calendar also had a week view that didn’t make for 3.16. We didn’t have enought time nor design material to make the old week view reach GNOME quality standards. It wasn’t working correctly, it had many design flaws (not only about aesthetics, but some subtler things like multiday events, all-day events, et al). We hope to have new mockups by the Design Team this release, and then we can craft it correctly. Again, this is much of a core feature that absolutely cannot be poorly done. This will happen with the major rework over the edit dialog. I personally recognize the importance of this item but, since Calendar is early at GNOME’s house, it is not the highest priority item. No idea how it’ll look like, and almost surely will land only at 3.20. I hope that you guys had a taste of Calendar with the preview release this cycle. Besides the features discussed above, we’ll have some other background improvements, stability fixes and many, many bugfixes. Google Calendar for Android has a good overview and workflow to be honest. Also I hope that you include the Outlook task section in the future. Not the sidebar, but the tasks you have open/finished that day. Mainly as I make tasks from mails I need to act on and can plan on when I pick them up. 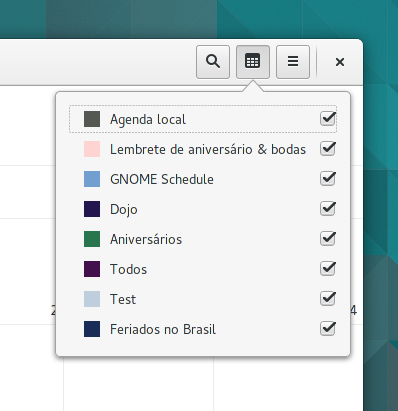 Unfortunatelly, for the moment, tasks is out of scope for GNOME Calendar. We can revisit it later but, for now, we won’t focus on anything related to tasks. I dare to think you already did this, but It’d be interesting to see what other calendar Software do to avoid those design challenges you mentioned for the Week View. You could get some inspiration from there. Yes, looking what others do is a great source of knowledge. Google Calendar is a specially good designed application. When we come up with the final designs of week view, I can blog about it, how we reached it, etc. When it comes to calendars I’ve yet to come across anything better than that of PalmOS, especially since it scaled well from tiny screens up to regular sized ones. If you haven’t tried it out, I can recommend doing so. I hope the week view will take into account that Monday, not Sunday, is considered the start of the week according to ISO-8601 (the only international date standard worth bothering about — anything else is local deviation). Calendar honors the system’s first weekday. 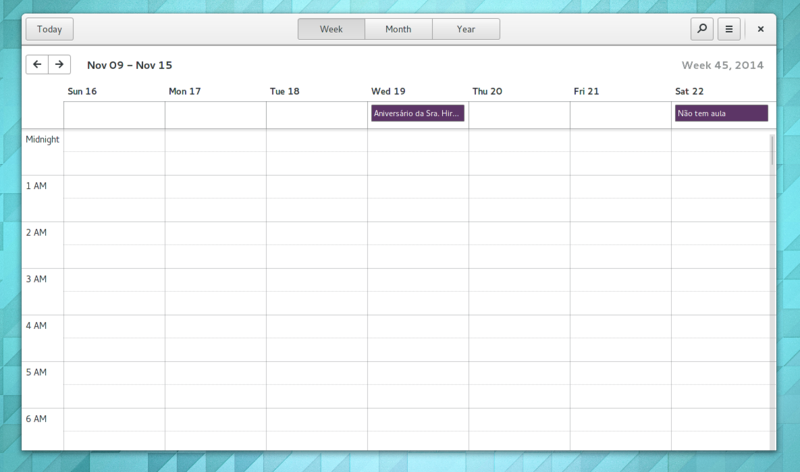 You can adjust it from GNOME Control Center and Calendar will respect that setting. Didn’t see the poll, but some kind of Maps integration would be nice as well, same goes for the GNOME Shell notification thingie at the top, that you could from a calendar event click and get Google Maps in the browser, or GNOME Maps app with the address associated with the calendar event… and yeah.. same thing in the Calendar app.